The Whitehall Choir is one of London’s leading amateur choirs. It has a varied repertoire including challenging unaccompanied pieces as well as larger choral works. On Thursday, 27 June at 7:30pm, the Choir will perform settings by George Shearing, William Mathias, Emma Lou Diemer and John Rutter of texts by Shakespeare and his contemporaries. The concert will take place at St Peter's in Eaton Square, and will be followed by a drinks reception under the portico of the church. If you think you might be interested in joining Whitehall Choir, come to a rehearsal at the beginning of term, normally in January, April or September. Next term starts on Tuesday, 2 April. Or come to the second rehearsal, an Open Rehearsal, on 23 April, explained in the video featuring our music director Joanna Tomlinson, below. Rehearsals run from 6.30-9pm, and it's always a good idea to arrive early to get your music and find the best place to sit. If you let us know you are planning to come (please email joinus@whitehallchoir.org), we will be sure to have music ready for you to borrow. We hope to see you and look forward to welcoming new members! Next term we will begin working on our summer concert (Songs and Sonnets: Shakespeare by Shearing, Mathias, Rutter and Diemer), which we will be performing on 27 June at St Peter’s Eaton Square. 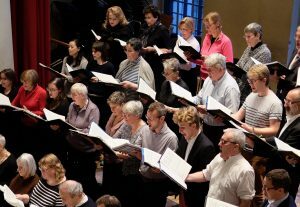 After the Easter break, on 23 April there will be an open rehearsal to which all singers are invited, whether or not you are planning to join the choir. It begins at 6:30pm at St Peter’s Eaton Square and there will be a drinks reception afterwards to give you the opportunity to talk to members of the choir.